The Saddest Festival on Earth: Budapest's Unfresh Fish Festival. "Why so sad, beef? Because carp meat is back!" There are certain foods that Hungary does very well. Bacon, for instance, or anything that comes off a pig, for that matter. Sour cabbage is a major food group. They do amazing things with poppy seeds - Hungary is a paradise for anybody who desperately wants to fail a urine test. But there is one area that is, arguably, not the Magyar culinary strong point. Fish. Hungarians are not big fish eaters. Hungary has never had a sea coast (OK... it controlled a bit of one once but that didn't make them fish eaters - it made the Istrians fish eaters.) 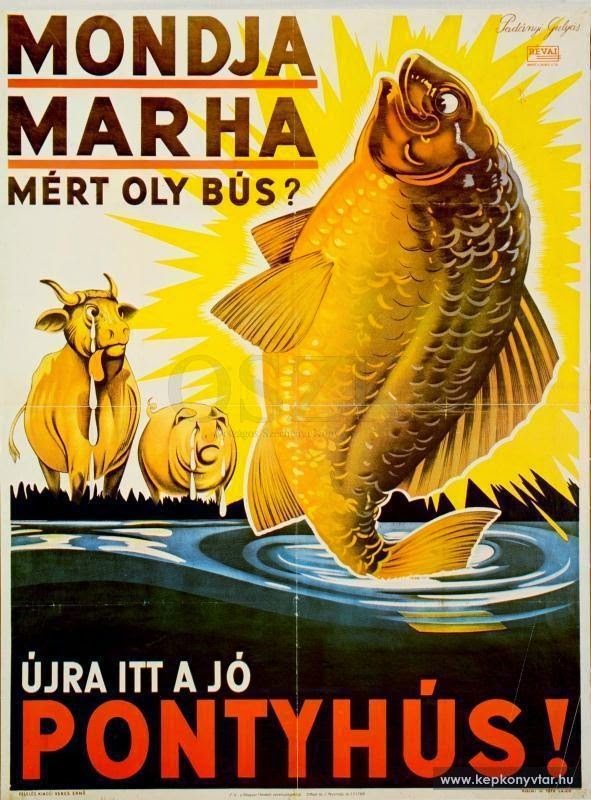 Maybe Hungarians were big fish fans back in the old Uralic days when they spoke something close to Mansi and called three fish “holom hol” but then they discovered pig protein and became Invincible Masters of Pork and once they got their hands on paprika they have never looked back. Those lemon slices should help dissolve the bones. Hungarians are big on fish enjoyment, true, but the main source of fish here is carp, usually eaten at home on Christmas Eve. Nothing wrong with that… if you eat carp. In fact, most Hungarians find the flavor of salt water fish strange and oddly dry and prefer the fresh water standards that they can get from the Danube and the lakes of Pannonia. But the downside is that most people don’t cook fish more than once a year, and that recipe consists of boiling a carp into oblivion in enough paprika to mask the fact that the sludge in your soup bowl is, in fact, a boiled carp. Now, I would not normally use this space to … ahem… carp about bad food, but we went to an event billed as the “Hungarian Fish Festival” in February at the Budapest city park. We went hungry, eager to see if the trout farms and EU supported aquaculture industry would be out there to tempt us with their best, freshest product. Not a chance. It was a nightmare of bad food, poorly prepared, showcasing the worst of a cuisine gasping for respectability in an area it has no experience with. Sure, you can argue "try it, you might like it" but some foods have traditions built into them, and you don't stray. New England clam chowder anybody? With "mussels and crab and smoked salmon"? Boston clam chowder with mussels, crab and "extra salmon"? Hungary has been going through a “foodie” craze of late, with TV shows aping all the latest western celebrity chef shows and a booming growth in “street food” yards, because, you know... street food. Ersatz burger, taco, and pho joints opening up offering unrecognizable gleet that would never inspire nostalgia in a Jersey burger craver, a Mexican on a pulque binge, or a Viet hungry for soup. Fine. If it will feed the tourists and drunks it can survive. Fish kolbasz! The flavor treat of the future! But the Fish festival was a promotional effort for a fish cuisine that just… isn’t. One trend in the Hungarian foodie circuit these days is to produce “traditional” foods that were often invented last week. There are the "Hungarian pizza" stands. There is the "lepeny" stands offering "Hungarian burritos. These are just sad. Hungary has a lot of old style foods that are or were sold at fairs and markets for on the go eating. Langos. Sausage. Fried fish. We know this because… ahem… some of us are not tourists and perhaps we actually like traditional Hungarian dishes. “Fish cabbage” is one such case: a paprika-laced sour cabbage dish – sort of a Frankenstein version of the original recipe made with pork as “Székely kaposzta” – but using carp in place of meat. I have lots of Hungarian cookbooks, including a cookbook of recipes from one of Hungary’s poorest regions, the Nyirség in the northeast, which includes recipes for survival foods like stewed minnows and crow stew. Not a single mention of “fish cabbage” in it. And it says "Balaton fish cabbage"... as if anybody living near lake Balaton would choose to make this into a winter cabbage dish instead of the usual dishes prepared in the main Transdanubian source of fresh fish. There is no heritage like fake heritage! Herman Ottó was a Hungarian naturalist – and one of my favorite writers in the Hungarian language – who wrote reams about fish and fishing in Hungarian folk culture in the last century… and he never mentions any fish dish using cabbage. But wait.. it gets worse… much worse. Ladies and gentlemen, I present to you the carp sausage. Carp carp carp carp... and carp. This is the culinary equivalent of genocide, an act so unacceptable as to be an outrage against the idea of eating as a means of life. Basically, it is a carp – a soft fleshed, fatty fish with armor scales and a habit of eating the eggs of any other fish it finds and noted for its multiple rows of small floating Y-shaped bones that defy filleting – ground into a paste and mixed with paprika and stuffed into a natural sausage casing. So, yes, it looks like a sausage. But it is carp. Vendors were selling these everywhere. No, I did not try one. And I truly doubt that any of the vendors dared to either. What is interesting is that until this year, I had never seen one of these sausage chimeras for sale anywhere. And my guess is that after this year I will never see one again. Carp in a tube. Think about that. This is one we saw abandoned at a picnic table after its purchaser suffered through one single agonizing bite. This is, perhaps, the saddest food picture I have ever taken. We were visiting on a Sunday afternoon, which meant that a lot of the fish was being sold at reduced prices… but that is to say it wasn't exactly the freshest of fish. I really wanted to try something, I actually skipped lunch to save my appetite for the festival… but I simply could not. I watched one “chef” prepare the catfish stew – which is a favorite of both my Mother and I - big chunks of giant wels catfish in a paprikás sauce served over cheesy noodles. If I see this in a restaurant I almost always order it. However... today it was an unattractive primordial mess. Harcsapaprikás of my nightmarish dreams. The Chef-like Guy working the Festival franchise booth dumped a tray of pre-cooked catfish chunks in a rustic looking pan, opened up a five gallon jug of orange-ish sauce and dumped that on top, stirred it around to take the chill out of it, and presto: instant culinary heritage! No, I simply could not make myself order a plate. This was food served on an industrial scale, with no love at all - food to milk the tourist forint. This is not food I would want to eat. The fried fish? Nope. Most of the fish looked so dull – eyed and dried out it could have been five or six days old. I'm a sport fisherman. I cook a lot of fish. I was raised next to the Atlantic ocean, and Fumie is from Tokyo: we know what fresh fish looks like. Bullhead, horned pout... an invasive American species in Europe. Eat 'em! It doesn't look like this. This was one food festival where I went home hungry. If you want to try Hungarian fish dishes, there are great restaurants that specialize in fish: try the Aranyhal in Zuglo or the Horgasztanya in Buda. If you are ever in the Hungarian countryside, say in Szeged or Paks do not miss a bowl of the fish soup – even declared enemies of the carp such as myself surrender to the paprika camouflage. But in Hungary if fish and tourists show up in the same space… wait until you can order a veal schnitzel. If it is a beef goulash or pork stew on offer, by all means - the ones at festivals are great. Those are something that any Hungarian with the least experience in the kitchen can shine at. But stay away from the fish. For the love of God, stay away from the fish. And thus I again successfully manage to post something that does not reflect on the horrific levels of corruption, incompetence, and cynicism that permeated Hungarian politics this week!